509 pages of action, mythology and history combined into a very satisfying series. The two that become one – the twins of legend – the gold and the silver- one to save the world and one to destroy it. The entire six-book series happens in the space of ten days. 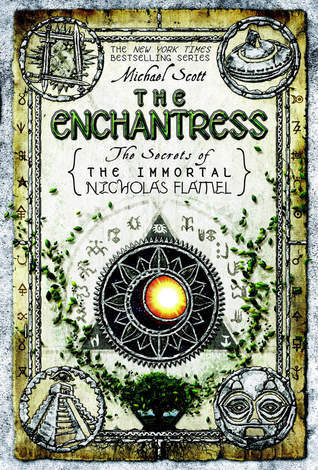 The Enchantress wraps this series and story up beautifully bringing all the time, mythology and magic of each age together to create a new world of energy and hope. Josh and Sophie Newman, the gold and silver, are on one island, Danu Talis. They have the four elemental swords and are seeking to understand the powers arranged around and before them. Will one age fall so another can rise? Is all of time known and foretold since the mysterious beginning? Is the path of one’s destiny defined, or are there choices? At the same time Nicholas and Perenelle Flammel are on Alcatraz with the monsters of old trying to defend the right of the humans to take their place in the flow to time. The aftermath of these two epic battles create the magic of our time. Some Immortals have reached the end of their times, others remain and still more will learn of the elemental magics that unite us all in the ebb and flow of time and life. Michael Scott does a masterful job combining and entwining mythologies, gods and magically strong characters throughout history. It is interesting how order emerges only from chaos and the dawning of hope only begins after a clash of power. Where are we in this process of time today?